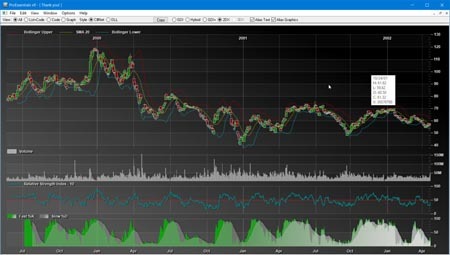 C++ Charting Library Walk-through: source code adding cpp charts to Win32 EXE. 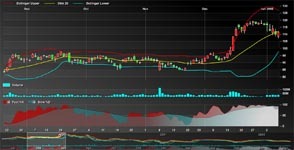 Includes 100% Native Charting Library Demo as well as WPF and Winform EXEs for comparison. The following demonstrates your first Visual Studio Visual C++ Win32 Charting implementation. This example is an absolute minimal Visual Studio Win32 project. 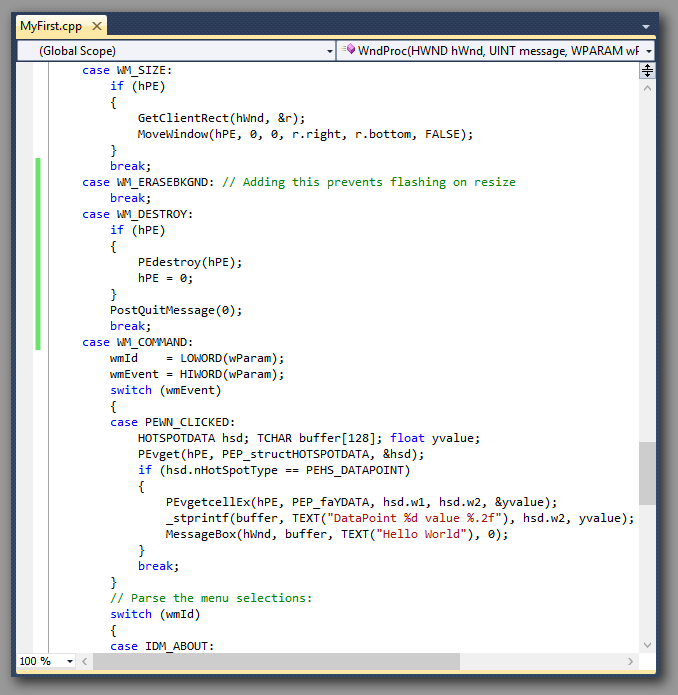 For a VS2013 MFC project, see the MFC Charting Library VS2013 walk-through. The product eval comes with a large MFC example project. For finding DLL specific features within our help system, click the Contents Tab at the top-left location, near the bottom click ProEssentials Reference, then see the Alphabetic Listing. The .Net Reference section is the best source for researching properties. 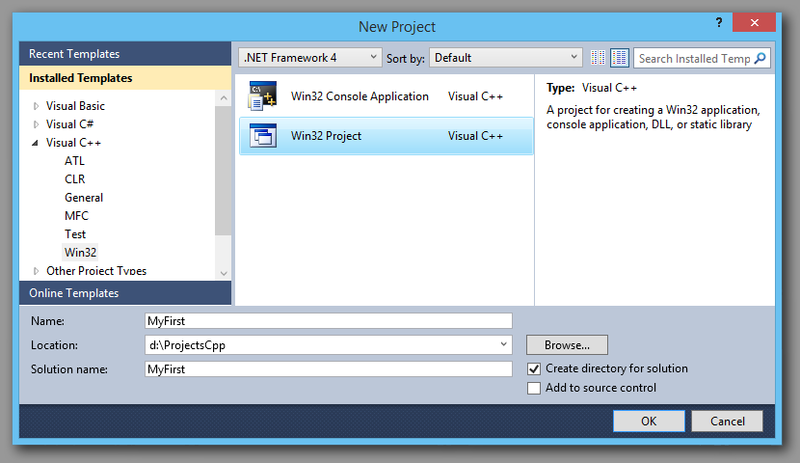 Launch Visual Studio and use the File / New... menu to launch the [New] project dialog. Within Tree select [Visual C++ - -Win32 ], select project template [Win32 Project], and supply a project name [MyFirst] and project location. 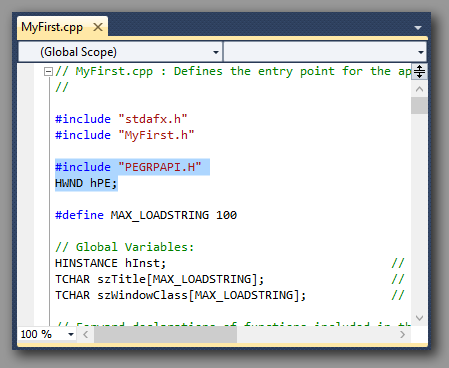 1) Copy "PEGRPAPI.H" and "PEGRP32G.LIB" from the C:\ProEssentials9\VC demo directory to where the [MyFirst] project is located. Note, if usingStandard version, use "PEGRPSG.LIB". 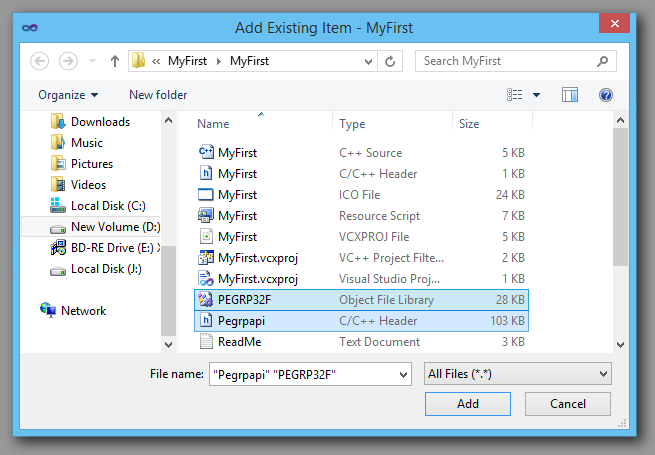 2) Use the [Project / Add Exiting Item...] menu to add "PEGRPAPI.H" and "PEGRP32G.LIB" to the [MyFirstMfc"] project. 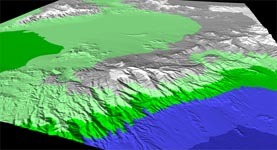 The image shows the existing files being added to your project. The include statement adds the ProEssentials header file which contains constants and function declarations. The variable hPE is used to store the Window's handle for the ProEssentials chart control. 4) Then within file "myfirst"s InitInstance, initialize hPE to NULL. 5) Near the top of WndProc, add variables used later to initialize the chart. 6) Add the below message switch statements. See images below for clarity. 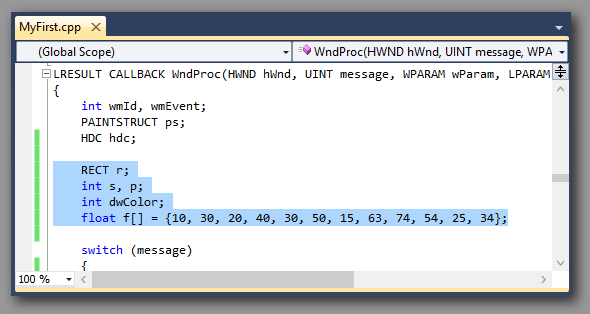 case WM_COMMAND: this handles the hot spot event, showing a message box. MainTitle and SubTitle are set first. Note that setting SubTitle to an empty string hides the subtitle. Subsets and Points define the amount of data you'll be passing. 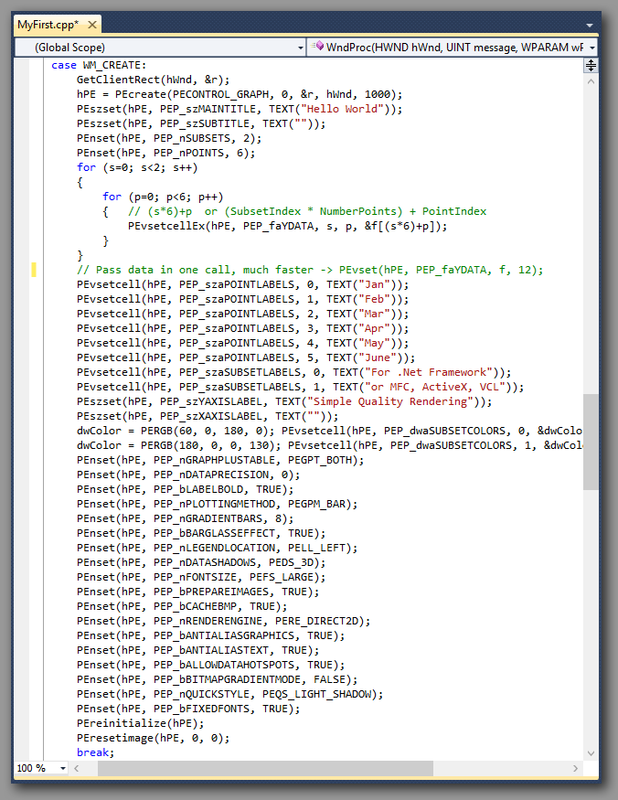 Next, we pass some random data into the Y Data two dimensional property array. PointLabels sets the data point labels located below axis. SubsetLabels sets the subset legend text. Next, we set various other properties controlling visual aspects, and enable flicker free updates with PrepareImages. Finally PEreinitialize and PEresetimage tells ProEssentials to initialize and resetimage the image, in other words, you're done setting properties. Run your project and you'll see a similar form. Add tabs, right click the chart to make changes, etc. Congratulations, you've just completed your first C++ Charting ProEssentials implementation. 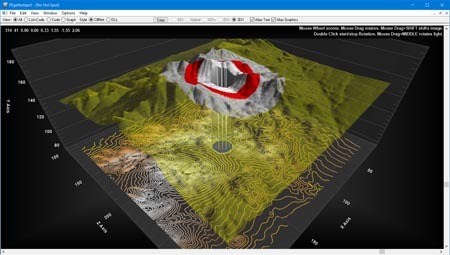 Complete online technical reference to the ProEssentials product. The .NET Reference is the best mechanism to navigate the large quantity of properties and features. 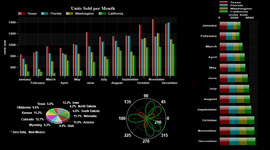 Walk-Throughs of charting in VB.NET, C#.NET, ASP, VC, and Delphi get you started quickly.